Dogs are stupider than we thought, although probably they’d argue the point if they had a clue. OK, maybe not stupider. 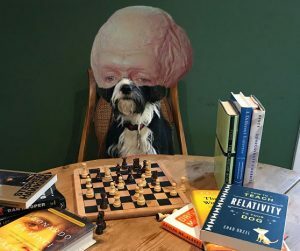 Maybe even smart, but certainly not exceptional, according to a new study of the intellectual abilities of dogs by psychology professors Stephen Lea and Britta Osthaus of the University of Buzzkill Big, Fat Weenies. Sorry! We’re feeling a bit defensive here. Numerous studies have focused on dog intelligence, but few on other animals that, for some reason, object to electrodes being jammed in their brains. This led Lea to wonder whether dogs seemed smarter due to the lack of comparative research and because dogs continually scored so high in Candy Crush. Measuring the intellect of some dogs is easier than others. Lea’s and Osthaus’ controversial study has dog owners questioning whether their canines are exceptionally bright or “just a damn fool dog,” as Uncle Max often sneers at Thanksgiving. What other animals were studied? Not fish, I hope. They’re such cheaters! No fish, but dolphins which, of course, are just fish with excellent publicists. Other animals studied included wolves, hyenas, cats, horses, and even pigeons. Also chimpanzees because they demonstrate the advanced behaviors of wearing diapers and riding tricycles, much like Congress. Zing! What was the study’s criteria? Am I using that right, criteria? The study assessed the animals on various types of cognition, which means their ability to start car engines on bitter cold mornings. No, no, wait! That’s ignition. My dogs are exceptionally intelligent. But on walks they sometimes pee on each other’s heads. Is that smart? Only if their heads are on fire. Zing! 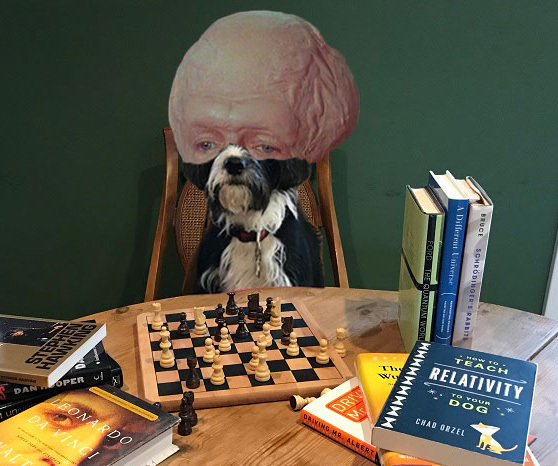 Unlike their Giants, dogs rarely question their own intelligence. That applies equally to Budleigh, the shrewd Bernie Madoff con man of terriers, and Brisby, whose coat is soft and nice. Brisby chews, pounces, chews. Budleigh glowers. Sleeping between Giants welcomes your comments. Probably. « Ask a Terrier: Your Dog or Your Boyfriend. Is That Really a Question? Cognition you ask? I am always careful to pee in the same places so as not to upset the Earth’s ph balance to prevent further green emission. Also I really want to snap that pigeon’s neck. Thanks, Yellow Snow Dog! You are a study in intellectual purpose and feral viciousness. Admirable! Thx for the much needed giggles today. Thanks, algteacher! You always know which lines are the funniest. You should write these columns! Training: Sharp teeth don’t make you right. What dogs think, if at all. Ownership: With great power, etc., etc., yeah, yeah! News and tips for you. Because, of course, your dog can’t read. Words, not deeds! Just the columns. ©Copyright 2019 Sleeping between Giants | Life, if you could call it that, with a terrier | All Rights Reserved.